Even after working with this agency for more than 20 years, I continue to discover little surprises in the buildings, grounds and art cared for by our employees. I was recently walking in National Statuary Hall's upper gallery and stopped at the "Car of History" clock by Carlo Franzoni where I saw a small bust of George Washington carved into its marble chariot. Washington's profile faces the front of the vehicle while Clio, the muse of History, stands above looking out over the room. The Car of History where Washington's profile can be seen to the right of the clock. I've walked under that chariot thousands of times and never knew the bust of Washington was there. This got me thinking... Washington created this capital city, picked its location, laid the building's cornerstone and he rises into the heavens in Constantino Brumidi's "Apotheosis" under the Capitol Dome, but where else does he show up? There are more than 30 pieces of art in the U.S. Capitol that feature or include his likeness. He appears in sculpture and paintings throughout the building from large spaces, like the Rotunda and committee rooms, to places more off the beaten path including a stained-glass window in the Congressional Prayer Room, a bronze doorway in the Senate wing and a stairwell in the House wing. Two of the art pieces in the building featuring Washington have a special connection to my time serving as Architect of the Capitol. 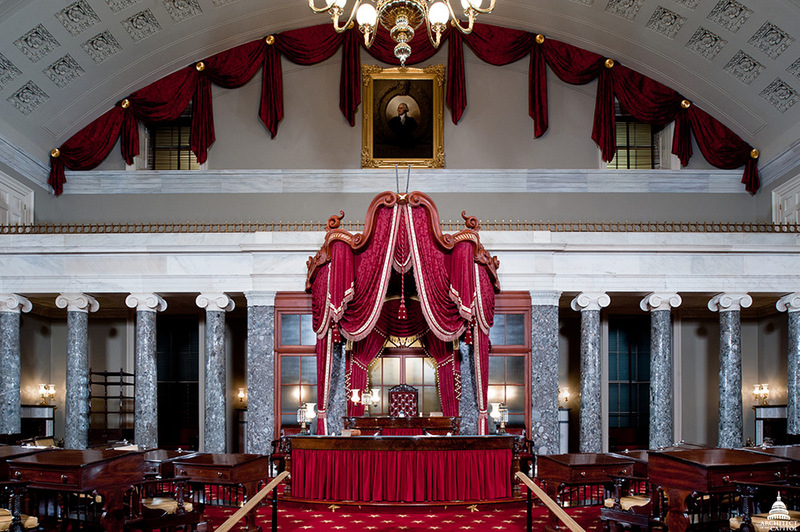 The Old Senate Chamber after restoration in 2012. The first of these pieces was present during my swearing-in ceremony. Directly above where I stood to take the oath of office in the U.S. Capitol's Old Senate Chamber hangs a "porthole" portrait of George Washington by Rembrandt Peale. This portrait was created in 1823, then purchased in 1832, the centennial of Washington's birth, for display in the Old Senate Chamber. On the lower part of the frame, a stone sill is engraved with "PATRIAE PATER," meaning "Father of His Country." Portrait of General Washington by William Dunlap, 1783. The second George Washington piece I have a connection with has spent much more time with me. I see it on a daily basis as it hangs in a corner of my office opposite my desk. This pastel portrait by William Dunlap in 1783 is one of the oldest works of art in the U.S. Capitol. It is a unique depiction drawn from life showing General Washington in his blue and buff military uniform. In 1940 it was bequeathed to the Congress in a will and accepted by the Joint Committee on the Library. 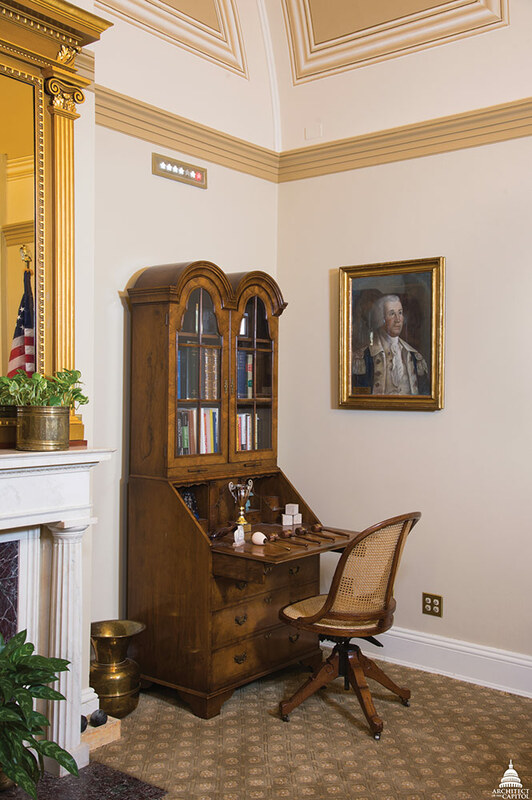 It has hung in the Architect of the Capitol's office ever since, except when on loan for exhibition. As I walk the U.S. Capitol corridors, my eyes and thoughts are often looking for my next surprise. Thank you Stephen! I really enjoy these gems that your share! I have a view from my apartment on Pennsylvania Avenue of the Capitol. It is always in my sight and I feel as if I have a relationship with your office. When the flags are up on either House and the light is not shining at night atop the dome, I make a call to your offices and am always greeted with a quick "light on" when appropriate. You are so lucky to be the protector of this treasured building! Dear Mr. Ayers, Thanks for sharing your discovery of the image of George Washington on Clio's car of history. 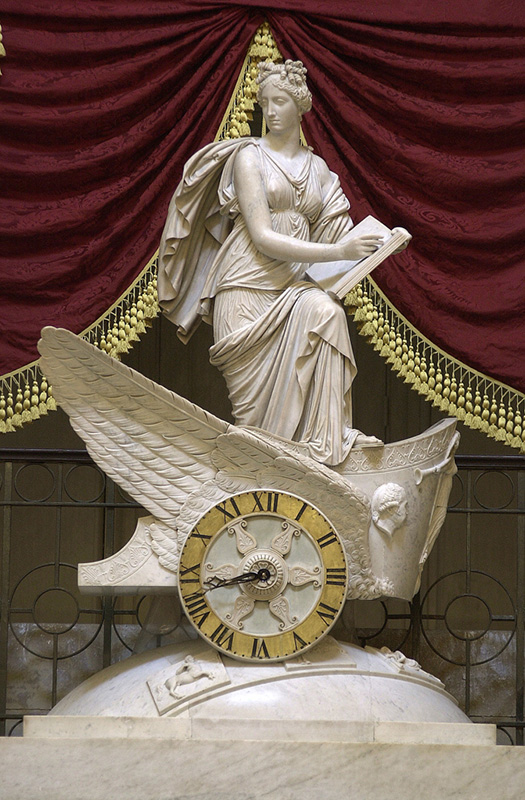 Clio is a more benevolent image than Father Time, who carries all before him from his perch above the Main Reading Room at the Library of Congress. Even though he's not driving a chariot, when I see it, I recall Andrew Marvell: "But at my back, I always hear Time's winged chariot hurrying near." What a place to work! Thanks for all that you do to preserve our country's history.